Isn't this a lovely photograph? This is one of my favorite photos of a completed Spring Garden Tee provided by this fabulous knitter. 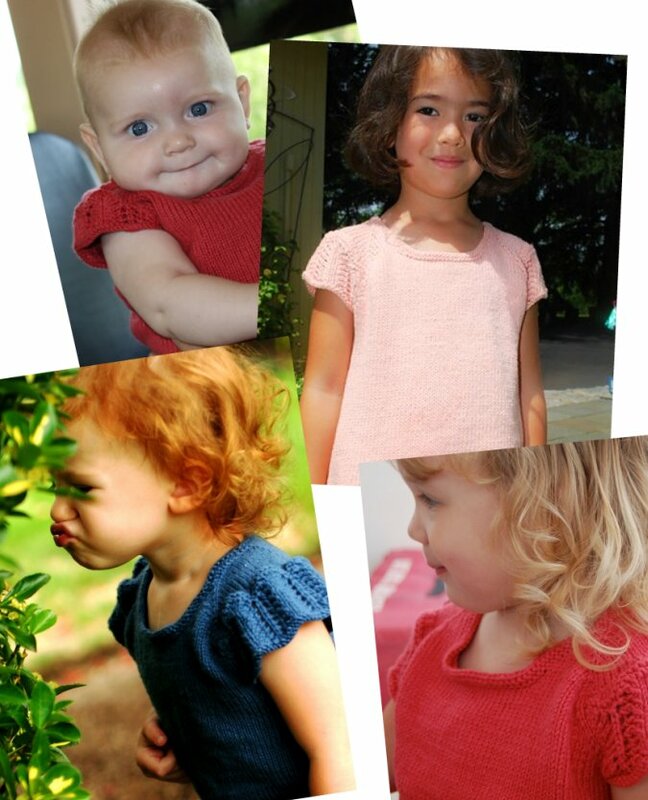 The Spring Garden Tee pattern has really been a hit! 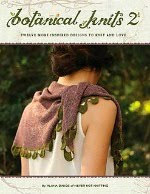 There are many wonderful versions to look through on Ravelry. Some have added the lace pattern on the bottom hem which is a nice touch (here), and other knitters even modified the top into a cardigan! (here, and here) What great ideas! I'm so happy that this pattern has been such a success. 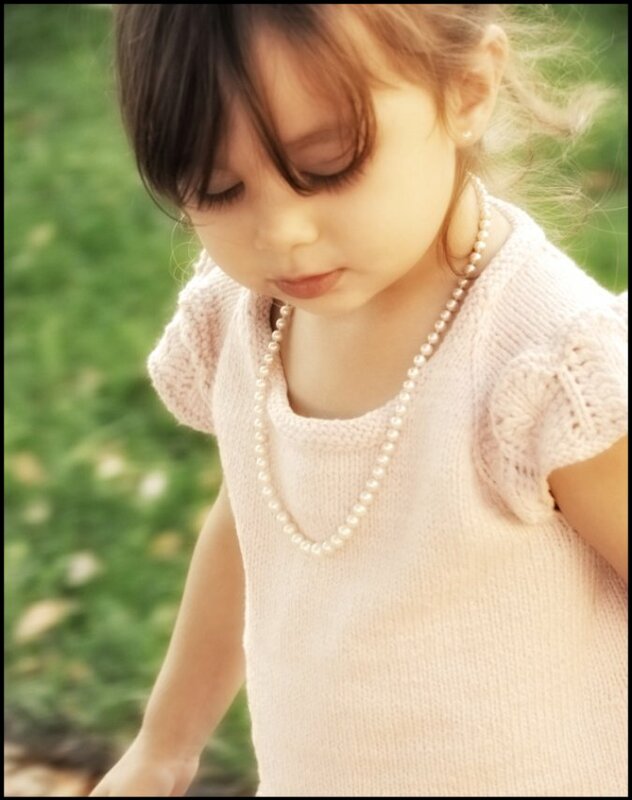 The Spring Garden Tee happens to be the knitted garment that my daughter still gets the most use out of. It is a versatile look and also the Rowan Calmer that I made it out of is holding up so well! No pilling! Here are a few more cute Spring Garden Tee shots for you, but please be sure to check out the rest of the awesome versions on Ravelry by clicking here. Here are some pictures of the lovely NeverNotKnitting line of "100 row knitting counters" available through PrettyKnittyJewelry. Counters are available here. Pam has designed the counters after 3 of my children's sweaters. Spring Garden Tee, Watermelon, and Playful Stripes. I review these row counters and explain how they work in Episode 22 of the podcast. The winner of episode 21's drawing is Amanda! Congratulations! *Dont forget to enter this episode's drawing! All listeners will receive free shipping on all purchases made in the prettyknittyjewelry etsy shop until October 1! 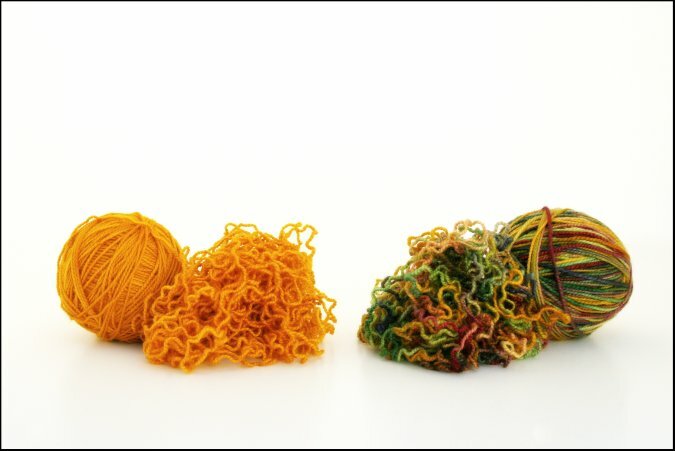 Just remember to mention NeverNotKnitting in the checkout process! If you have been reading my blog for awhile, you will undoubtedly know that I love knitted toys. So when I came across this adorable little frog pattern, I knew what had to be done about it. I just couldn't resist this little frog's cute round tummy and happy little face. He needed to become part of my daughters knitted toy family. And are we ever happy that he did! 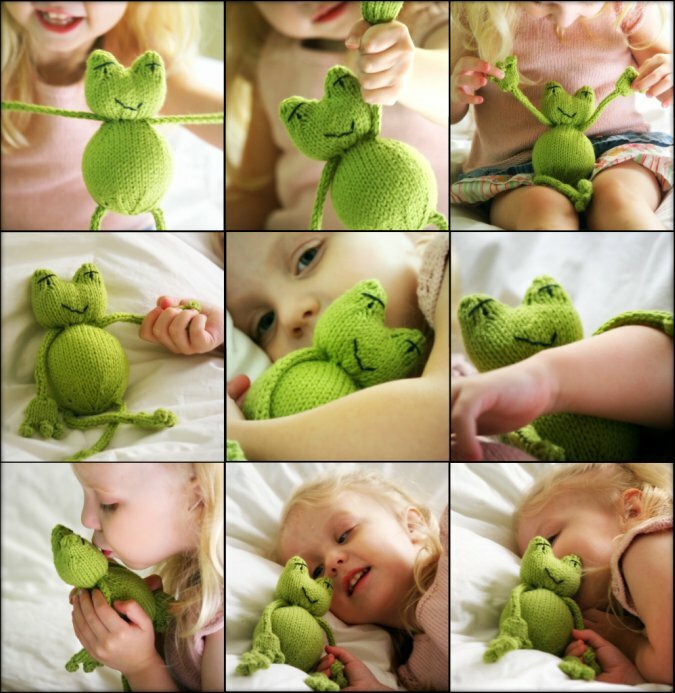 Ribbit has been accompanying my daughter everywhere! He has been a playmate through the day and a friend to cuddle with at bedtime. She is thoroughly pleased. But it wasn't only the cuteness that drew me to this pattern. I also think it is just soo clever that his tummy is stuffed with a tennis ball which makes him hop around like a real frog when he's tossed about. What a cute idea! Also he took only a tiny amount of yarn. I already had leftovers of Spud and Chloe Sweater yarn in the color Grass from my Chloe pattern. (yarn found here) So it worked out perfectly! Even after knitting up this little frog, I still have leftovers to make this cute little hat in the future! I love it when I can use up scraps! 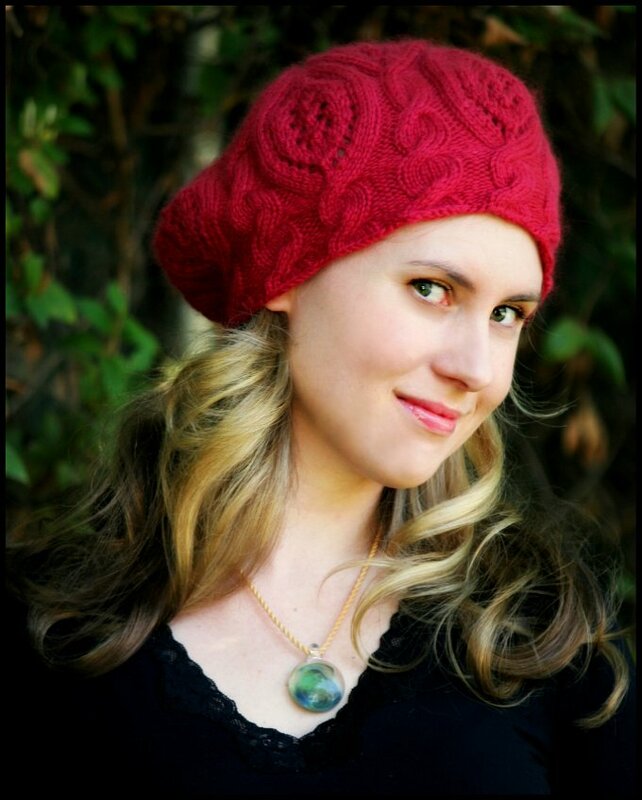 OK, so I still have a little bit of a lingering hat phobia, but this Rose Red hat pattern was just too pretty to pass up. I loved every single thing about this project. 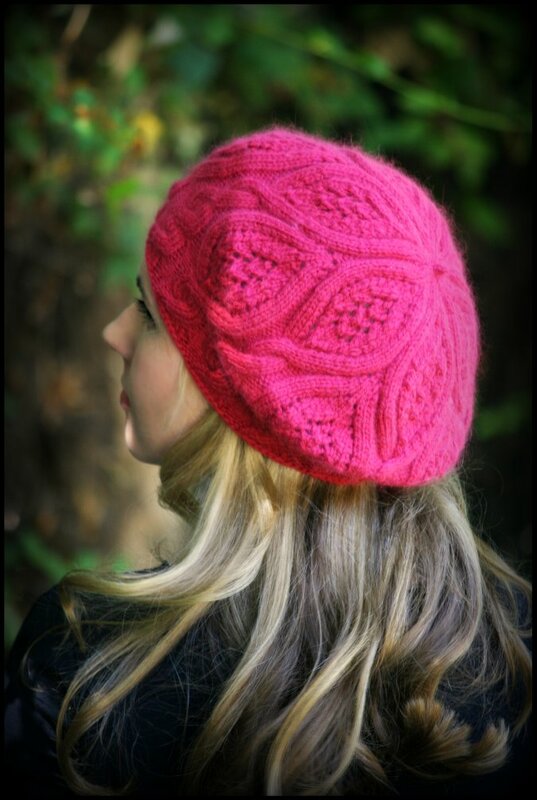 The pattern was so fun to knit up, I never wanted to put it down. 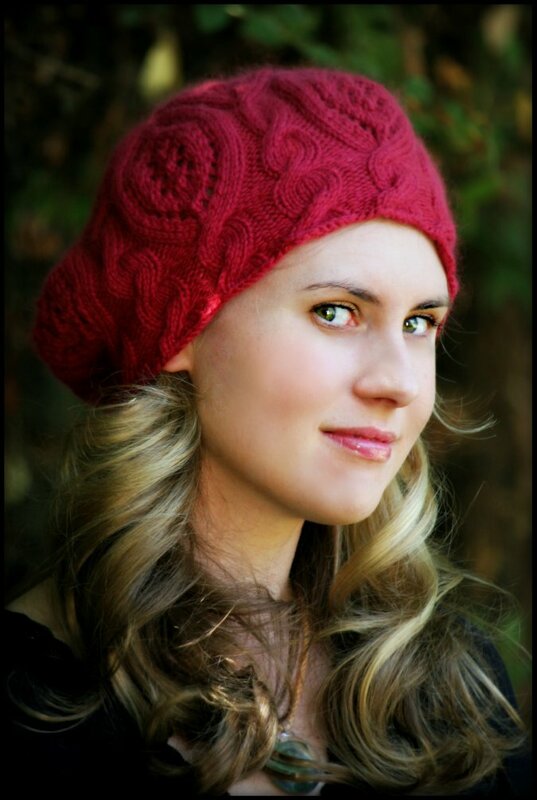 Potentially, I could knit nothing but Rose Red for the rest of my knitting life and be happy. Really truly happy! Well.. maybe I'd get bored eventually, but.. yes.. I could knit it over and over again. It is just so fun to see a pattern form right in front of your eyes with every stitch. It's for this reason that stranded knitting is so addictive as well. It's a source of instant gratification in a more time consuming project. The yarn that I used was Sublime Angora Merino which is a lovely blend that is fuzzy but not too fuzzy. Since I knit my Lush and Lacy Cardigan a year ago now, I've really loved the look of lace work in angora yarn. The trick is to find an angora blend. Something that still has a reasonable amount of stitch definition. My Rose Red took a little over one ball. So of course I'm left with yet another partial skein. Oh joy. I love the finished result. It's so feminine, so pretty, so soft. 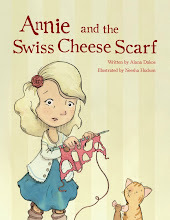 It will be great for Fall and Winter! Now..all I need to do is get used to wearing a hat in public without feeling ridiculous.. 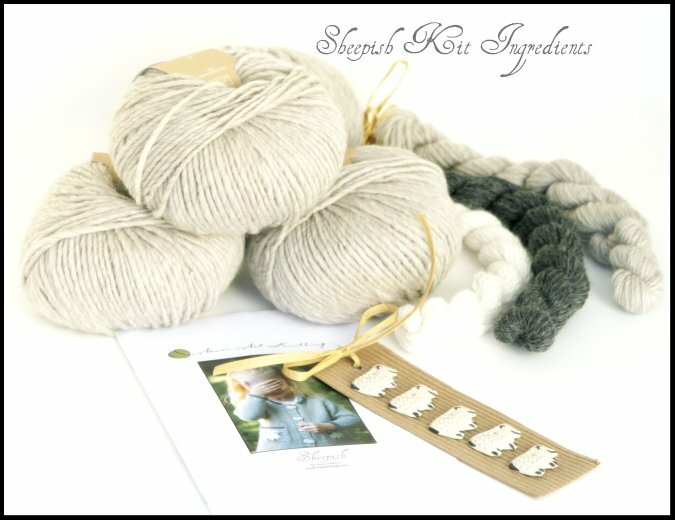 Kits For "Sheepish" Are Available! This kit has lovingly been put together by Dancing Ewe Yarns and contains all the materials you will need to create your very own "Sheepish" sweater. It includes all the yarn, the pattern, and the unique 'handmade in South Africa' sheep buttons that make this sweater extra cute! 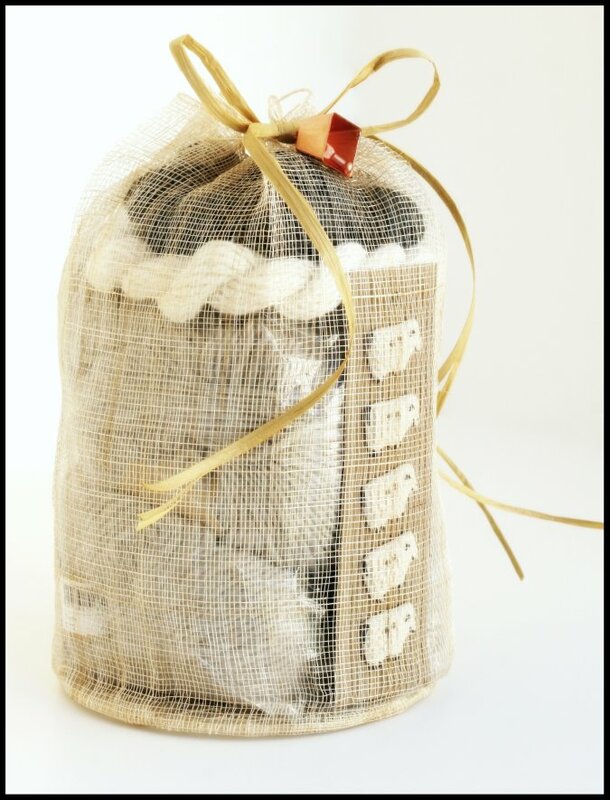 I think that this kit would make a perfect baby shower gift for an expectant knitter or a soon-to-be grandma! Especially if they haven't yet found out the gender of the baby, since this sweater could be worn by a boy or a girl. The sheep themselves take only a tiny bit of the angora blend yarn and the darker trim takes only a partial skein as well. The "Sheepish" kit includes exact yardage amounts making the kits more cost effective. Also you won't be left with those pesky partial skeins of yarn left over! The kits are available here. They will be happy to send them out to you! Dont forget to enter this episode's drawing! 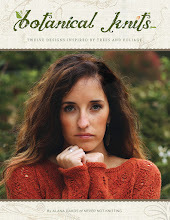 Dancing Ewe Yarns is offering 10% off of all Spud and Chloe Sweater yarn for the month of August. 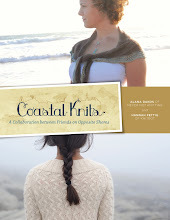 This offer is exclusive to the NeverNotKnitting podcast listeners and blog readers.